Sunway Group, today launched the #JomMalaysia Carnival which is being held in front of Sunway Resort & Spa. 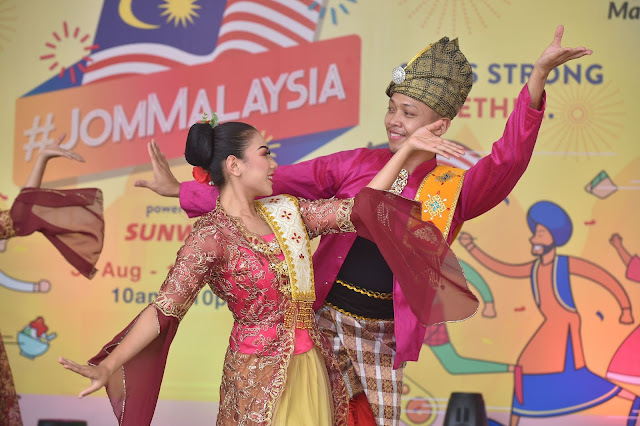 As a tribute to the national “Sayangi Malaysiaku” National Day theme, the Carnival aims to bring Malaysians from all walks of life to spend the National Day together as one community. The Carnival will take place today from 10 am to 10 pm today and tomorrow (September 1). The Carnival was officially launched by Sunway EXCO Member, Puan Sri Datin Seri (Dr) Susan Cheah, along with Sunway Group Brand Marketing and Communications Senior General Manager, Jane Poh and Sunway Education Group Senior Executive Director, Dr Elizabeth Lee Fuh Yen. As a kick-off to the festivities, there was a Malaysian drum performance by students from Sunway University. This was followed by a trishaw ride flag-off, which was one of the major attractions of the Carnival and a tour around the five experiential spaces – the Flavours of Malaysia (Food), Voices of Malaysia (Music), Cultures of Malaysia (Dance), Arts of Malaysia (Arts & Crafts), and Games of Malaysia (Games). The morning saw visitors queuing patiently at the entrance of the Carnival, eager to explore the mysterious “Evolution Tunnel” which was built within an existing rock tunnel. Inside, the crowd marvelled at the unique historical timeline which showcased Malaysia’s rich historical heritage alongside Sunway’s transformation from its early mining days into a multinational conglomerate today, in tandem with Malaysia’s progress as a nation. Enthusiastic foodies queued elbow-to-elbow around the many stalls at the Flavours of Malaysia. Malaysians and tourists where enjoyed local delights such as nasi kerabu, laksa, rojak, cendol and many more delectable fare where recycled crates were used to create a makeshift dining area. Visitors of all ages swarmed the “Childhood Food Store” to grab their favourite retro snacks such as White Rabbit Candy, Haw Flakes, Eye Glass Candy. Popular snacks like Laughing Cow Belcubes, Biskut Piring, Apollo Chocolate Wafers, Ice Gems, and Roti Ice Cream were snapped up by curious children who were delighted with the sweet and colourful treats. The graceful dancers from ASWARA Malaysia were a hit with visitors who encircled the Cultures of Malaysia stage. The crowd met every performance with enthusiasm, with some capturing the colourful moments on video while many posed for pictures with the dancers. Similarly, an enthusiastic group was seen at the Voices of Malaysia space where richly melodic voices and passionate live performances by the Malaysian Buskers Club captivated the audience. At the Traditional Malaysia Games section, groups of strangers came together to compete with each other amidst humorous laughter and good-natured jibes. 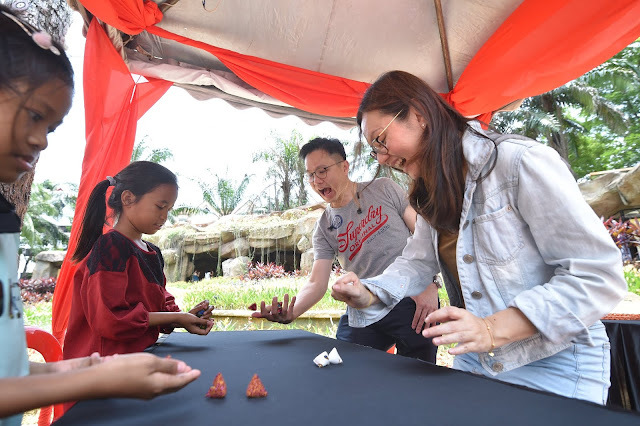 Each tried to best other players at old-fashioned games of congkak, batu seremban, teng teng, lompat getah, sepak bulu ayam, and even the eraser battle. The young entrepreneurs and artisans at the Buatan Malaysia and Heritage Street sections enjoyed brisk sales of their arts and crafts, clothing, accessories, toys and rattan-made items. Along the Heritage Street, Instagrammers were spotted busily editing their posts after posing with newly bought items or taking a shot of the pre independence architecture. The event also saw Malaysians pledging to create a greener and more sustainable Malaysia, signing their names on leaves which would result in a tree sapling being planted in Sunway Iskandar, Johor. Sunway is targeting to obtain 6,000 pledges which will translate to 6,000 trees being planted.